Jordan Ash looks to make a pass. The senior guard and the Wildcats went toe-to-toe with Indiana on Saturday. BLOOMINGTON, Ind. — With all eyes on the Big Ten Championship game just an hour’s drive north in Indianapolis, Northwestern’s wild back-and-forth 68-66 loss to Indiana at Assembly Hall did its best to take center stage Saturday. The Wildcats (6-2, 0-1 Big Ten), who scored only 46 points in Bloomington a season ago, shot a much-improved 44 percent from the field this time, but it was not enough to keep up with the high-flying Hoosiers (6-2, 1-0 Big Ten). With the game tied at 63 and only 39 seconds on the clock, five-star freshman guard Romeo Langford hit a floater in the lane that put the Hoosiers ahead for good. NU’s ensuing possession ended when a pass bounced off senior forward Vic Law’s hands and out of bounds. 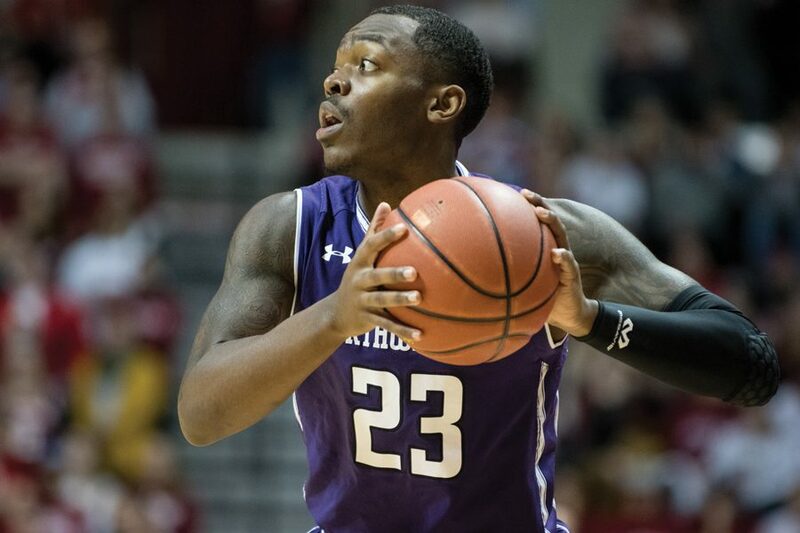 Senior center Dererk Pardon led the way for NU with 24 points and 10 rebounds. Pardon played almost the entire game (39 minutes) and the Cats needed him the whole way as he served as the hub of the offense and proved to be the only NU defender with a chance of containing Indiana’s Juwan Morgan. Langford and Morgan were the only Indiana players with more than 7 points. The superstar guard poured in 20, including that game-deciding floater, while Morgan pounded his way to 17 points and 12 rebounds. 1. Offense is fun. Chris Collins has earned his reputation as a defensive coach, but it was the NU offense that kept his team in the game Saturday. While Morgan and Langford helped the Hoosiers carve up NU, the Cats kept up with Pardon’s dominant post game and a 16-point game from Law. Defensively, however, Collins may have some work to do. Indiana likely would have won by more if not for their 11-for-19 shooting at the free throw line. 2. Dererk Pardon is a tank. The 6-foot-8 center who plays largely below the rim may be a dying breed, but Pardon is doing his best to keep it alive. The veteran has had his share of impressive performances throughout his career, and Saturday’s certainly ranks among the best. Always a reliable rebounder and armed with a variety of post fakes, Pardon also flashed passing and cutting skills to keep the ball moving. He did not, however, attempt another three-pointer. 3. But we still don’t know if Northwestern is very good. Northwestern’s performance was encouraging, but it’s important to note that Indiana may not be that great. The Hoosiers brought back most of their core from last year’s team, but that group closed its season with a loss to lowly Rutgers in the Big Ten Tournament. With Langford’s commitment expectations for the Hoosiers rose significantly, but it’s quite possible they’re just another mediocre team that will struggle to win games in the improved Big Ten.